Contextual Triggers : iDid Inc. 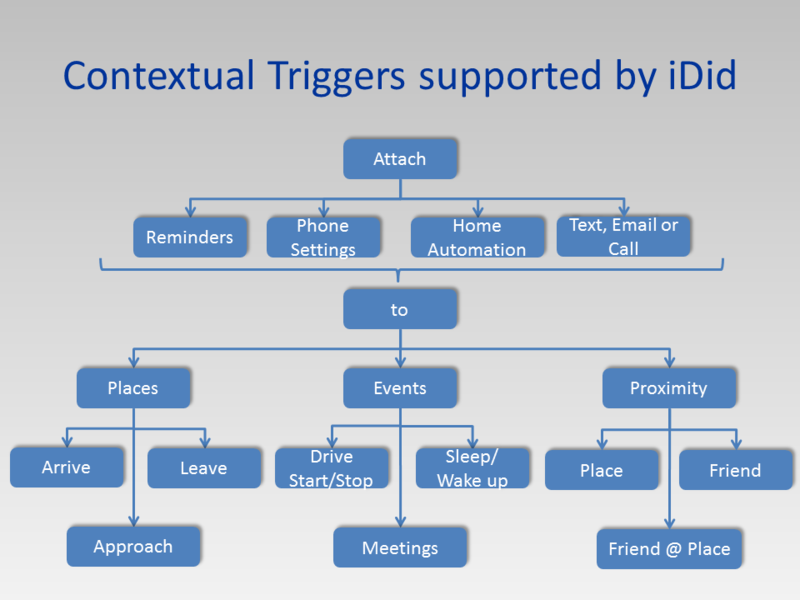 Build contextually intelligent use cases using the iDid platform. Remind me to call home/work when I start driving: Attaches a reminder to an event: drive start. Cool downstairs to 70 degrees when Sally visits: Attaches an automation to a proximity event: Sally’s location and home. Remind me to ask Tom about Sam when we meet: Attaches a reminder to a proximity event: Tom’s location and my location. In addition to these kinds of triggers, the app also supports Transition Triggers which operate when you transition from one place to another. For instance, “Unlock side door when I return home from Costco”. To setup, use the app’s user interface. Note that most commands are also supported through voice commands on the app itself or through Amazon Alexa. Contextual Triggers are only supported (for now) on the Android version of the app.